The most adorable hat pattern I’ve seen all year! Requires only one skein of Bernat’s Pipsqueak yarn, which is light and soft as a cloud. And it knits up fast on size 10 (US) needles. I’ve made several of these charmers and they’re always a hit. What a cool gift for any little person living where it gets cold in winter. 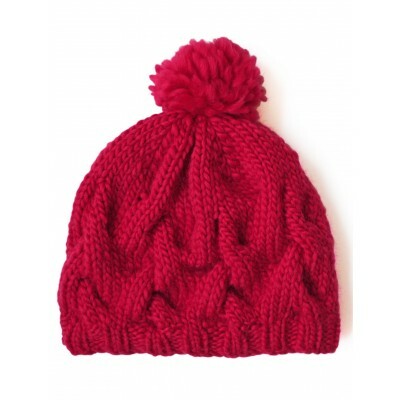 The loosely formed cables on this little hat are eye catching, aren’t they? That’s what first caught my eye, anyway, and when I checked out the free pattern, it became even more interesting because it’s made from roving, Paton’s Classic Wool Roving in Cherry. The pattern calls for size 9.5 and 10.5 (US) double points, and two skeins of yarn, which comes in 16 yummy colors. Looks like fun! From Fashion, number 185, an American Thread pamphlet from the 1960’s. The yarns specified are no longer available, but this should work with other worsted weight yarns. Click on the image at left to see enlarged instructions. 1st round: ch4, join, ch3, work 15dc in ring, do not join. Place a marker at beg each round. 3rd round: Skip 1 st, # 1 sc in next st, 5 sc in next st, 1 sc in next st, skip 2 sc, rpt from # all around. 19th, 20th and 21st rounds: 1sc in each sc. Cut yarn. Peak: Right side 1st row: with right side facing, work into front loop of sts only attach yarn in 4th sc before any dec pt, sc in same space, 1sc in each of next 8sts, cut yarn (4sts each side of dec pt with 1sc at dec pt) Do not turn at end of rows of peak. 2nd peak row: Attach yarn in 2sts before 1st sc of peak, working in front loop of sts at beg and end of rows of beret throughout 2sc in same space, 1sc in next sc, working into back loop of sts across peak sts throughout, 1sc into each of the 9sc of 1st row of peak, 1sc in next sc, 2sc in next sc, cut yarn. 3rd peak row: attach yarn in 2sts before 1st sc of previous row, 2sc in same sc, 1sc in next sc, 1sc in each sc of peak, sc in next sc, 2 sc in next sc, cut yarn. Wrong side: with wrong sides of peak tog attach yarn in 1st free loop at base of 1st row of peak, 1sc in each remaining free loop of peak, cut yarn. Work 3 more rows of peak same as right side, but work through both loops of sts. 6th row wrong side: same as right side but attach in st before 1st sc, complete row. 7th row wrong side: work in sc attaching yarn in 1st sc of peak, cut yarn. Finishing: with right side facing attach yarn and sl st both sections of peak tog, working through back loop of sts. 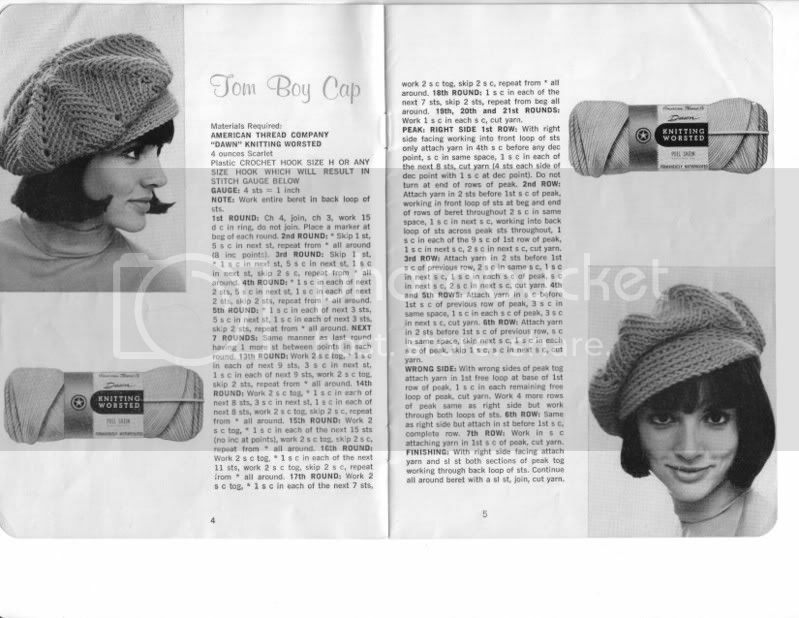 Continue all around beret with a sl st, join, cut yarn. Thanks to knotrune for the transcription. 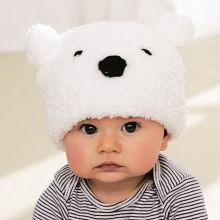 First day of Autumn’s coming, time for more cute baby hats. These patterns are all over the web, but I couldn’t resist posting mine. 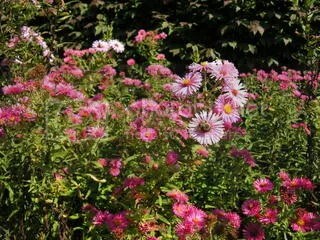 Also including a shot of the asters in our CT garden, abuzz with bees this warm, sunny afternoon. There’s said to be a sharp decline in honey bee numbers this summer, but we sure have plenty of bumble bees! season. However, the colonies of bumble bees, unlike those of honey bees, only survive during the warm season; new queens hibernate alone to begin another colony the following spring. In addition, there are usually fewer individuals in a bumble-bee colony than in a honey-bee colony, and bumble bees do not use a dance to communicate the location of food to other members of the colony, as honey bees do. 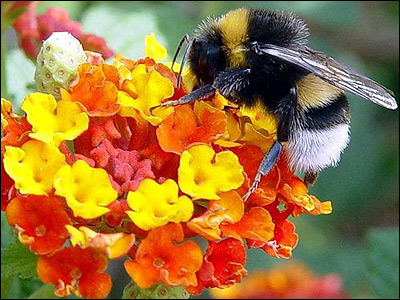 Also, although bumble bees collect nectar and store it as honey, they do not hoard large amounts of it, as do honey bees. Bumble bees are sensitive to habitat disturbance. In England, several species are thought to have become extinct in past decades due to land clearing and agricultural practices. Posted a couple of year back on the Lion Brand Yarn website, this one’s a keeper: a hat that will keep it’s shape even after many washings. 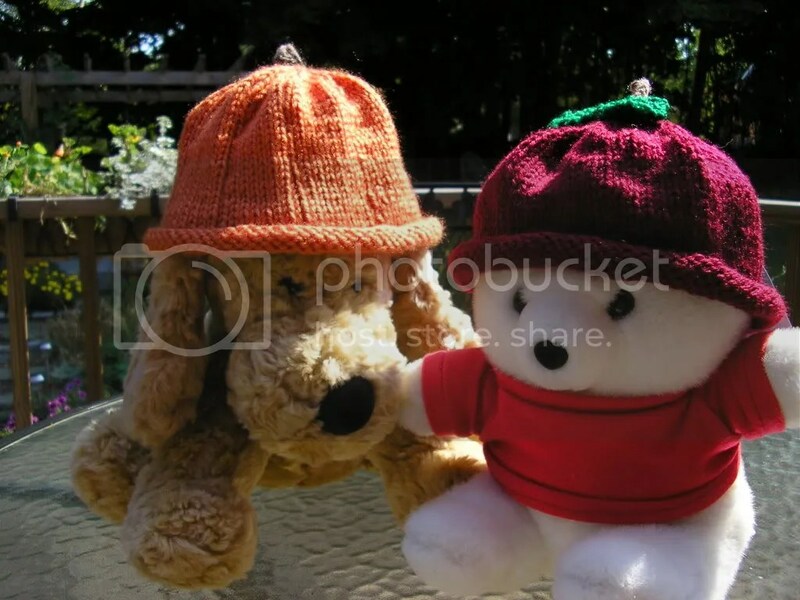 The one in the photo was made with worsted weight wool and a size G-6 hook. What a great hat! Since it’s crocheted, it should hold it shape really well even after washing. And suitable for both men and women, what could be better?! Requires two balls of Hometown USA yarn and a size P-15 (10mm) hook. Have fun! From the new catalog by Lion Brand, available here. Crown: Chain 4. Join with slip stitch to form a ring. Rnd. 1: Ch 3, 13 dc in ring, join with a slip stitch to top of ch-3. 14 dc counting ch-3 a s 1 dc. Rnd 2 : Ch 3, dc in same st with ch-3, 2dc in each st around. Join each rnd with a slip stitch (sl st) to top of ch-3 , 28 dc. Rnd 3: Ch 3, 2dc in next st, * dc in next st, 2dc in next st; rep from * around . 42dc. Rnd 4: Ch 3, dc in next st, 2dc in next st, * dc in next 2 sts, 2dc in next st, rep from * around. 56dc. Rnd 5: Ch3, dc in each of next 2 sts, 2dc in next st, * dc in each of next 3 sts, 2 dc in next st ; repeat from * around. Continued in this way to inc 14 sts every rnd, having 1 st more between incs each rnd until there are 8 (9,10)sts between incs. 1st dec Rnd: *Work 8 (9,10)sts, draw up a loop in each of the next 2 sts, yo (yarn over) and through 3 loops on hook ( 1 st dec); rep from * around. Join . 2nd dec. Rnd: * Work 7 (8,9)sts, dec; rep from * around. Join. Continue in this way to dec 14 sts every rnd, having 1 st less between decs each rnd until there are 6 sts between decs. Headband: Work 6 rnds of one sc in each st. Join and fasten off.